Of the 14 national parks and reserves in Nepal, the Royal Chitwan National Park is the oldest and most popular safari destination for visitors. Situated in the subtropical Tarai lowlands, the jungle is home to endangered animals such as the one-horned rhinoceros and the royal Bengal tiger. Other animals include leopards, wild elephants, Indian bison, sloth bears, crocodiles, pythons, monitor lizards, pangolins, and over 400 species of birds. The terrain is mostly flat, consisting of dense jungle, marsh, and grassland. There's no guarantee of good game sightings, so it is best to spend at least two days in the park. Elephant safaris are the most popular way to explore the park. Jeep safaris, guided walks, overnight jungle expeditions, and canoe trips are also available. There is a wide choice of accommodation, ranging from luxury camps or hotels within the park to budget options on the outskirts. The best place to look for budget accommodation is Sauraha, becoming something of a tourist centre with hotels, restaurants, bars, travel agents, money changing facilities, shops, and even internet cafes. The town has a beautiful setting, sitting on the banks of a wide river in the jungle. 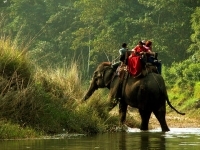 Transport: The Royal Chitwan National Park is an excursion from Kathmandu or Pokhara. It's linked by public bus, tourist coach, and air, and is a seven-hour bus journey from Kathmandu or six hours by bus from Pokhara. Admission: Daily park entry permit: NPR 1,500 (extra charges apply for those wishing to fish, canoe, camp, or go on safaris).